Ethiopia wants to become a middle-income country in the next decade while staying carbon neutral. How the capital of Addis Ababa grows will be key to meeting that goal. Photo by Daniel Cusick. Nothing like it has been tried before, much less in one of the world's largest and poorest nations. "No other African country has even begun to make the level of commitment that Ethiopia has in reducing emissions," Robert Mukiza, Ethiopia country director for the Global Green Growth Institute, said in a recent telephone interview from Addis. His organization is working with the government to help implement sustainability programs, including elements of Ethiopia's Growth and Transformation Plan. The blueprint for Ethiopia's climate agenda, drafted by the government in 2011 and now being implemented across all levels of society -- from the herding villages of the central highlands to the transit corridors of Addis -- is embodied in a 15-page document called the "Climate-Resilient Green Economy strategy," or CRGE. Much more than an emissions plan, the CRGE is a multipronged development program that promises to hold Ethiopia's greenhouse gases at 145 metric tons of CO2 equivalent per year over the next 15 years, while also lifting the country from among world's poorest nations to achieve middle-income status by 2025. The challenge is immense, the cost astronomical, and failure is a distinct possibility. A path to a low-carbon Africa? Consider that Ethiopia currently ranks 186th out of 198 countries in per-capita gross domestic product, and roughly a third of its estimated 94 million people live on less than $1.25 per day, according to recent World Bank estimates. But no one, least of all Ethiopia's prime minister, Hailemariam Desalegn, is bowing to the conventional wisdom that Ethiopia's only path to climate security is through foreign aid agencies and nongovernmental organizations. In fact, officials here argue the opposite, often invoking the words of the late Prime Minister Meles Zenawi. In 2009, he told U.N. climate delegates gathered in Copenhagen, Denmark, that Ethiopia would not stand by as Western nations develop and implement strategies to address the world's most pressing environmental problem. "Africa is a continent of the future; it is destined to be a growth pole of the 21st century," Zenawi declared. "We are therefore here not as victims of the past," he added, "but as stakeholders of the future reaching out across the continents, so that together we can build a better and fairer future for all of us. ... Africa is a green field that can and wants to chart a different course of development, one that is not carbon-intensive." Now Ethiopia faces an early critical test of its climate commitments as it prepares to impose binding caps on greenhouse gas emissions for 2020 and beyond. Those measures, spelled out in the country's proposed emissions targets submitted to the United Nations in June, will be a focal point of the next round of U.N. climate negotiations happening in Paris in December. The Paris meeting will differ from previous U.N. conclaves, most notably because developing countries like Ethiopia will for the first time have to take a measure of responsibility for addressing climate change and participate in multilateral strategies to reduce greenhouse gas emissions. Gone is the notion that poor nations, especially in Africa, cannot help solve the world's environmental problems. In its place is an expectation that a country like Ethiopia, endowed with some of the continent's greatest renewable energy resources, can and will develop a program to secure its own climate security while providing a model for its neighbors to follow. The stakes are high for Ethiopia and particularly Addis, where the city's booming industrial, transportation and building sectors are potential sources of rising greenhouse gas emissions. Today, those three sectors account for just 20 metric tons, or roughly 13.4 percent, of all of Ethiopia's greenhouse gases, according to government estimates. That compares to 130 metric tons produced by the country's agriculture and forestry sectors, the top two greenhouse gas emitters by volume. 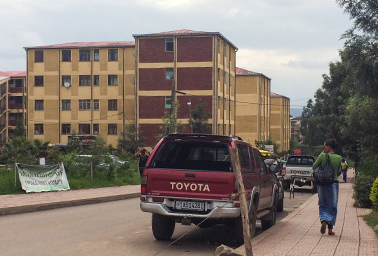 Nearly 250,000 new housing units are coming online in Addis, which the government hopes will ease daily commutes for city dwellers. Photo by Daniel Cusick. But as is the case across much of Africa, rapid urbanization is tipping Ethiopia's emissions profile. "Urban growth is major issue, and even in the past with a smaller population and before the construction boom, there were challenges in the city of Addis with meeting sustainable development goals," said Robi Redda, an adviser with the Climate and Development Knowledge Network who has worked with Ethiopian officials to craft a national emissions reduction strategy. That's because in terms of real growth, Addis Ababa is the engine that now drives Ethiopia. Recent projections call for more than a doubling of the region's population -- from 3.4 million to 8 million people -- by 2020, while annual economic growth has reached double digits for a good part of the last decade, converting broad sections of Addis from hovels to high-rises. It was inside one of those new developments, a five-star Radisson Blu, that Dessalegne Mesfin explained how Ethiopia intends to keep its economic engine revved while holding its carbon emissions to no more than 145 metric tons, or roughly 64 percent lower than what the country would emit under a business-as-usual growth scenario. Mesfin is the former deputy director of Ethiopia's Environmental Protection Authority, where he helped develop the CRGE. He is now a consultant on applying ecological principles to development, or "eco-economy." For Addis, Mesfin said, a key component of green growth will be converting the city's underdeveloped manufacturing and service sectors into 21st-century hubs of technology, energy efficiency and supply-chain innovation. The strategy includes new firms vying to serve Africa's burgeoning computer, IT and medical fields, while also adopting ecosystem-based industrial zoning whereby one firm's waste becomes another firm's raw material. Pollution associated with solid waste disposal currently accounts for 13 percent of all emissions generated in the city. For example, a leather tannery's wastewater could be treated and converted into process water for a nearby manufacturer, or waste heat generated by a cement kiln could be recovered and used in a co-generation power plant. "In this way, it could be possible to leapfrog the historical Western model of development and address what your country in previous days couldn't solve," Mesfin explained. Firms that move into Ethiopia's new eco-industrial parks will also receive 100 percent carbon-free energy, much of it coming from plants like the 6,000-megawatt Grand Ethiopian Renaissance Dam being built on the Blue Nile River near the Sudan border. The $5 billion hydropower project, expected to be operational by 2017, will deliver baseload power to Addis and other regions where the government has put development on a fast track and where incomes are expected to rise fastest. A second massive hydropower project, the 1,870 MW Gilgel Gibe III Dam on the Omo River in southwestern Ethiopia, began delivering its first power last month. Excess power from the two hydrodams, along with hundreds of megawatts of renewable energy coming from Ethiopia's new wind farms and geothermal plants, will be sold both domestically and to neighboring countries, further enhancing Ethiopia's green growth agenda, officials say. Indeed, some here frame Ethiopia's climate strategy as only partly stemming from a desire to protect the country from harm caused by climate change. An equally important part of the strategy is for Ethiopia to raise millions of dollars in revenue by tapping regional and international carbon markets. "Ethiopia doesn't say, 'I will act only if developed countries are acting,'" Mesfin said. 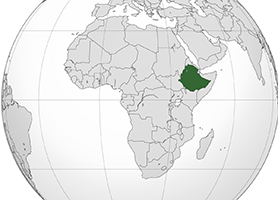 "Under the [CRGE] strategy, Ethiopia says, 'I will act because the opportunity is here, now.' That's why it sets the bar high, even as a least-developed country. "We don't believe in a green economy that is separate from the rest of the economy," he said. "Ethiopia believes in one mutually supportive and inseparably linked strategy. One cannot divide the country so that this section is for climate mitigation and this section is for economic development. Both must exist simultaneously." In key ways, Ethiopia's development program borrows heavily from China's model of growth, including an adherence to strong central planning and massive investments in infrastructure projects -- like the Grand Ethiopian Renaissance Dam -- designed to meet social, environmental and economic priorities. In Addis, the largest expression of that approach is an elevated ribbon of concrete and steel rail snaking through the city and converging at Meskel Square, Addis' largest open-air market and gathering place for festivals, public events and occasional demonstrations. The superstructure is sub-Saharan Africa's first modern light rail transit (LRT) system, built at a cost of $475 million by the China Railway Engineering Corp., in partnership with the Ethiopian Railways Corp. The electric-powered rail line, 85 percent financed by the China Export-Import Bank, began carrying passengers last month along 10.5 linear miles of track linking the city's northern and southern suburbs to the central city. An east-west line, nearly 11 miles in length, is expected to begin operating this month. Experts project that the light rail will help displace thousands of older motor vehicles, including gasoline- and diesel-powered cars, trucks, taxis and buses that pump roughly 1.4 million tons of carbon dioxide into the city's air annually. Those vehicles account for 29 percent of Addis Ababa's carbon footprint, according to a recently completed greenhouse gas inventory competed by the Addis Ababa City Government Environmental Protection Agency with support from the World Resources Institute and EchnoServe Consulting PLC. Gifti Nadi, an Ethiopia-based consultant with C40, a collective of global cities that have committed to leadership on climate change, said Addis' public transportation system has long relied on state-owned buses and more than 4,000 Toyota taxi vans, called "mini-buses," that ply well-established routes and are cheap enough for average city dwellers to use. Passengers wait to board the Addis Ababa Light Rail Transit, which Ethiopia hopes will displace 1.4 million tons of annual vehicle emissions. Photo by Marthe van der Wolf, courtesy of AP Images. Now officials are looking for new strategies to reduce tailpipe emissions while helping to increase mobility. "For Addis, vehicles, especially old vehicles, are a real source of both congestion and pollution," Nadi said. The LRT will also allow aid in the pursuit of transit-oriented development in neighborhoods along the rail line and other designated corridors. 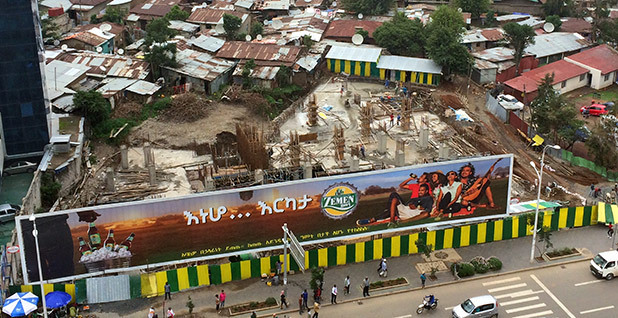 Ethiopia's Ministry of Urban Development, Housing and Construction, working alongside city officials, has initiated the completion of nearly 250,000 new housing units in the city, mostly in condominium blocks that are sprouting up across the central city and surrounding hillside neighborhoods. The new housing is expected to ease daily commutes for thousands of city dwellers while also raising new tax revenues to pay for the LRT. 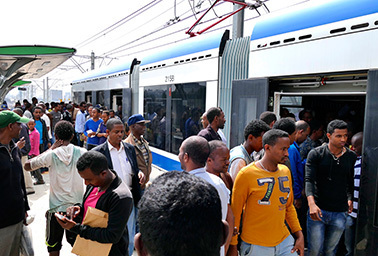 On a July afternoon, in the shade of one of the LRT's concrete flyovers near Meskel Square, a 26-year-old Ethiopian who identified himself only as Isaac offered his view on the as-yet-unfinished transit line. "I am very happy for this [rail] to be built here," said Isaac, who said he emigrated to Addis from northern Ethiopia's Tigray Region, roughly 500 miles away, to complete graduate studies in chemistry at Addis Ababa University. "When I get on, it will be the first train [ride] in my life." For now, he is mostly walking and busing between home and school while trying to make extra cash as a disc jockey and selling recordings of his music. Asked if the LRT will help him move more easily around the city, he said, "If it goes where I need to go, I will use it." It remains an open question, though, whether large numbers of Addis Ababans will abandon traditional forms of transport for a modern LRT. While the line's construction has been highly visible and a source of pride and daily conversation among Ethiopians, reaching its projected capacity of 60,000 passengers per hour will require converting thousands of drivers and walkers into riders. Concerns have also been raised about existing residents, many of whom are seeing their neighborhoods reconfigured with the advance of new residential and commercial development. But experts like Nadi remain optimistic. She said Ethiopia's shift to a new way of urban living has been happening for about a decade, and residents are adjusting to the conditions. "Addis Ababa has been a melting pot for hundreds of thousands of people, coming from all corners of the country in search of better employment opportunities and services," she said. "With major infrastructure projects designed to reduce the negative impacts of climate change, the co-benefit is an improved quality of life for all."